March 22, 2019 ~ Last Saturday we attended the Earthquest Raptor show at Brazos Bend State Park. We went last year and have also seen a presentation at Quintana Beach County Park. You might have seen a show like this at the Texas Renaissance Festival where they give you a little history of the birds, a lecture on disappearing habitat and/or global warming and encourage all the children in attendance to become eco-warriors. Maybe I thought this guy was a bit over the top with his implication that it is all our fault that “thousands of species have gone extinct”. As long as species have been evolving, species have been going extinct. It is estimated that over 99.9% of all species that ever lived are extinct. Of course we are concerned with conservation and the environment but personally, I am happy we don’t have to share the planet with smallpox or dinosaurs. The star of the show for me was this Eurasian Eagle-owl. I was right on the front row, too close for flight shots but perfect for close portraits. I remember he said she was someone’s pet until growth and temperament made her too difficult for the owner to handle. Think you can’t buy one? Google turned up many sources. 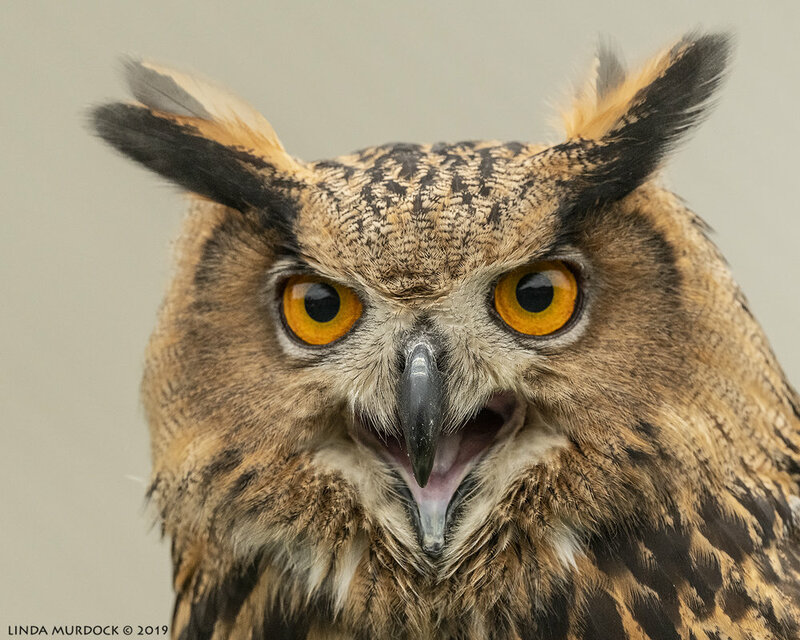 Possession of a native raptor or migratory bird in the US requires permits from Fish and Wildlife but not exotics such as the Eurasian Eagle-owl. Want to know more? Keeping Owls as Pets. Hey, this is not a recommendation, just information. Just look at those ear-tufts! Although found in the largest numbers in areas sparsely populated by humans, farmland is sometimes inhabited and they even have been observed living in park-like settings within European cities. Since 2005, at least five pairs have nested in Helsinki. This is due in part to feral European rabbits (Oryctolagus cuniculus) having recently populated the Helsinki area, originally from pet rabbits released to the wild. Don’t you just LOVE unintended consequences? Since I was on the front row with my Nikkor 500 f/5.6, I concentrated on details. Look at those feet! One of the other handlers was about 30 feet away with another perch and some raw chicken. She flew down between the visitors and back. He did have a bit of trouble getting her to fly back into her cage, but giving her space beside it worked out. The least behaved bird was the Harris Hawk. We have them in Texas, but mostly in the southern parts. This gal was supposed to fly down to the end perch same as the Owl, but she took the opportunity to fly up into the surrounding oak trees. Several times. I am sure it wasn’t in the script but it did give us some opportunities for flight shots. Which I didn’t do well on at all, but judging by the posts on FB a lot of other photogs did. She even stopped for a while on the Martin bird house. Which was thankfully empty. Once she finally came back to the main perch, she got chicken treats. This shot really shows the nictitating membrane which protects their eyes. The Aplomado Falcon was a big hit. He (or she) was small and feisty. They only occur in parts of Texas and New Mexico but range all through Central and South America. I know they have been sighted occasionally in this Gulf Coast area. We looked for one reported near Brazoria Wildlife Refuge a few years ago but had no luck finding him. He also explored the nearby areas before coming back to the perch for more chicken treats. I always worry about them getting those leather straps caught in something but I guess they have adapted by now. They are actually called Jesses and popular ones are made of Kangaroo leather since it is so thin and lightweight. Beautiful birds, a bit larger than a Kestrel. Aplomado is the Spanish word for “lead-colored'“ referring to the predominate color of the bird’s back. This one looked more dark brown to me, but it might not have been full grown or perhaps there is a lot of variation in coloring. Or just the afternoon light. This was my favorite of the falcon. I was too close to get the entire bird, but the feet on the glove or bristly perch is not too attractive. Photography is always about compromises. We also saw an African Tawny Eagle which was enormous. I was so close I had to really concentrate on just head shots. I didn’t find a lot of internet info on this bird except they eat carrion as well as hunt for small mammals, lizards, snakes. They often steal food from other raptors and can be found with vultures. Sounds a bit like the same niche our Caracaras fill, doesn’t it? I did read that Tawny Eagle populations in Africa have decreased, with due to poison and traps. But it is listed as Least Concern; world populations are not globally threatened. After the show the handler brought out the Tawny Eagle again I got these portraits. He had just done a fluff up in the image above and I really like the head angle. Wonder if this was a pet at one time? He might of told us but listening, watching the birds and trying to get photos in a crowd is a lot to handle. Looking back at my photos I hardly changed my settings during the entire show. I should have tried a different f/stop for more depth of field since I was so close, but at least I remembered at the end! After the show, we stopped back by the entrance to check on the Great Horned Owlets. They are very accessible for photographers since they are right near the entrance to the park where you pay. Early one morning several photographers were set up with tripods and a bobcat attempted to scale the tree. Luckily, Mom Owl was close by and ran him off. I still think the babies are probably safer from predators in this location since there is so much traffic and activity. Did you know they are having an Earthquest Raptor Show at Quintana County Beach Park on Saturday, April 20, 2019 at 11 AM – 12 PM ? It is a fun event and the handlers are great about answering questions and even showing off the birds after the show. They clearly love what they are doing. Have you been to a Raptor Show? And have you seen the baby owlets at Brazos Bend? And isn’t it exciting Spring is here? And warblers are starting to show up at the migrant traps and in our backyards? Let me know in the comments below.